Now isn’t Jennifer Brown just clever? That linoleum in her bathroom needed some punch. So what did she do? She used our Midland Wallpaper Stencil to give it a whole new look! 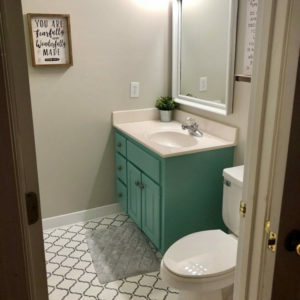 Wallpaper and floor tile stencils are all the rage these days and I have to applaud Jennifer for her “out of the box” thinking. How do you stencil a linoleum floor? Prime it first with Zinsers Premium Pro Primer (which sticks to anything!). Paint the floor with porch and floor paint (I like Behr brand) in what ever background color you wish to use. Stencil the entire floor with water based acrylic paint. Seal the entire floor with Polycrylic sealer (which won’t yellow and is super durable!). Admire your handy work and your pretty new floor! tile stencils to see if they inspire you.